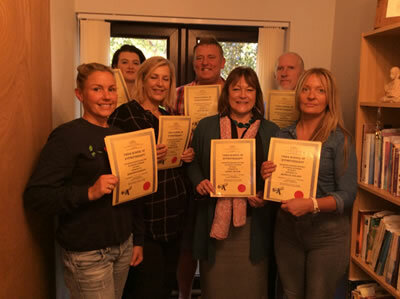 Tara School of Hypnotherapy is an accredited training school with the General Hypnotherapy Standard Council, and the British institute of Hypnotherapy. Learn hypnosis in 6 days consisting of three weekends. No previous experience required, you will become a therapist by the end of the course. A practical course, you will receive a Diploma at the end of the course. Contact by telephone or e-mail encouraged after the course. BSc Hons. A degree in applied psychology studied in John Moores University covered studies in consciousness, transpersonal psychology, sleep, counselling, bereavement, and the psychology of religion, including meditation. Pauline has qualifications in Advanced Hypnotherapy, N.L.P. E.F.T, Reflexology, the anatomy, and is also a Reiki Master/Teacher see link to Reiki courses. Hourly sessions of Hypnotherapy and Reiki available: Reiki sessions £30 Hypnotherapy sessions £50 for phobias…depression. Hypnotherapy and Reiki combined for complete relaxation £50. With the stresses and strain of today’s society it is imperative to fully equip hypnotherapy practitioners with a range of advanced skills to ensure competence to practice in these demanding times. The Tara School of Hypnotherapy will make a significant contribution to this goal. Anthony Mahony founded the school in 1995 after gaining his Bsc honours in applied psychology and also completed a doctorate in clinical hypnotherapy. Having taught many students from China, Australia, Kuwait and Germany. Anthony has appeared on cable television had articles published in the Liverpool Echo newspaper. Also has lectured on pain management to University students and hospital Physiotherapists. Several large companies sent their employees for courses in giving up smoking and stress management, these included Ford motor company, and Glaxo Smith Kline. 2. To help them to gain an understanding of themselves as well as helping others. 3. The skills will help them to achieve knowledge to help clients to overcome their psychological problems that affect their lives and their family. The course is also to awaken in the students a realization of how the thinking mind works at different levels, from the conscious to the Sub-conscious mind. 5. When our idea’s become transparent we become aware of our pure inner self. 6. When these idea’s become transparent, we are not limited to the mundane worldly matters that stifle our ability, we are then able to reach a level of freedom, moment by moment, in any given situation and achieve great things.